Free Webinar on Premium Reimbursement Software Now Available On-Demand! 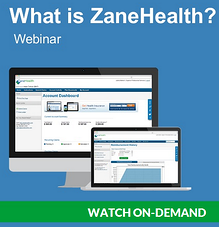 This week, Zane Benefits' JD Cleary discussed "What is ZaneHealth?" via webcast. The feedback has been outstanding, so we've made a recording available to everyone. As discussed during the webinar, small and medium-sized businesses want to offer health benefits, but the cost of traditional group health insurance is unsustainable. Additionally, individual health insurance is now better for employees and costs less. The solution is to drop group health insurance and save 20% to 60% by reimbursing employees for individual health insurance. As such, businesses and their brokers are adopting premium reimbursement software solutions, such as ZaneHealth, which allow for compliant reimbursement of individual health insurance. Health insurance professionals, CPAs, HR Professionals, CEOs, and CFOs should watch this 35-minute webinar to learn how ZaneHealth works, how ZaneHealth ensures compliance, and how ZaneHealth saves both the employer and employees on the cost of healthcare.